Ratchet high branch tree pruner with blue handle. reach and cut branches never before thought possible. total length = 9ft. This tree trimmer is ideal for cutting tough stems and branches. 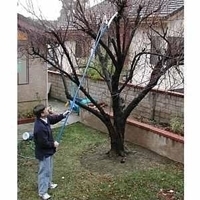 The contoured handle makes it easy to grip and prune tree branches with minimum hassle. The stainless steel blades help in smooth cutting and pruning and require low effort. We have years of experience working with cookware and promise user satisfaction. With free shipping over bulk buying, we offer the best deals for quality cookware products. Our prices are extremely economical with a promise of highest quality material and best value for your money.